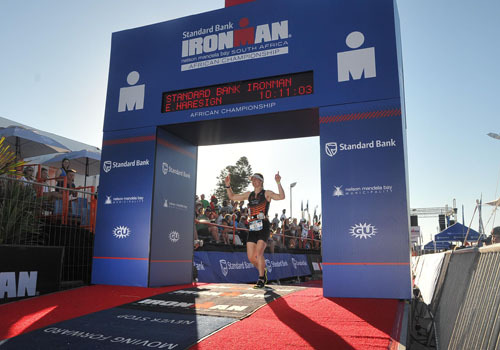 With a change in the route (implemented last year), Ironman South Africa has earned a reputation of a tough and fair bike course. This made it an appealing choice to make an early start to my race season, alongside the chance to try and see if I could gain points towards a Kona qualification spot. 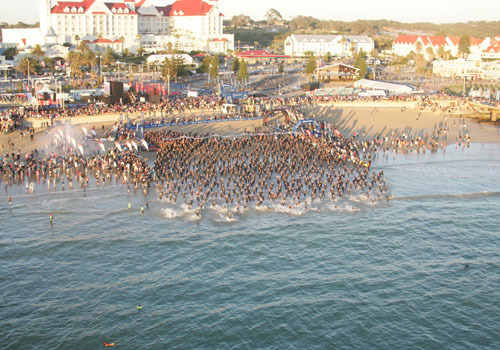 The event was also designated as the Ironman African Championships, which meant that there were double points allocations. This, however (compared to previous years) translated into a triple strength field. However, one of my aims is to always be able to race the very best, so I didn’t feel intimidated and decided to embrace the challenge! I had amazing support from Team Haresign: Mum, Dad and brother all in tow. After getting so excited at Weymouth during the run, trying to get time splits, Dad had taken his new role seriously and invested in a stop watch….! They couldn’t do enough to help me, giving me lifts to save my legs in the days before the race, providing a ‘team car’ on my bike course recce rides, and shark patrol from the jetty during swim practice (well, not really, they went for a coffee I think)! 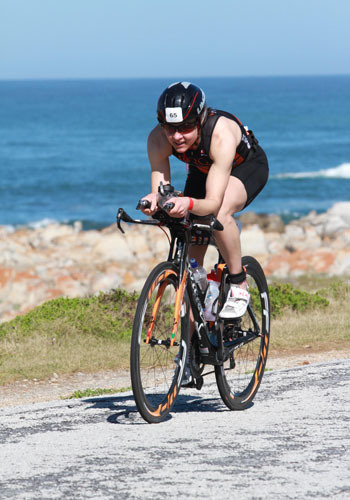 As race day approached, there were definitely two types of racer – some wanting the Beasterly Easterly winds that had made for relatively slow bike times last year, and others praying for the Westerly winds to blow them back into town for the marathon. I was very happy that we got the Easterly wind. The Easterly wind meant that we had slightly choppy conditions for the swim, but nothing too bad. My plan to get onto Susie Cheetham’s feet didn’t pan out, but I found myself in a group including Lucy Gossage, Caitlin Snow, Eva Wutti and Amber Ferreira and so I was pretty pleased that my Winter work on the swim had paid off. In fact, I found the pace rather easy after a while, but wasn’t too worried, as I knew I couldn’t have swam with these girls last year. However, I don’t know if we’d taken the scenic route, as we came out barely under the hour mark. Once onto the bike, my fears about ending up in a paceline were unfounded. As we climbed away from the town, we soon separated out and I saw Stefanie Adam up ahead. Otherwise on lap 1 the road was pretty lonely. It was however great to see the little camps of supporters (with their gazebos and braai), set up for the day to cheer us all on. Later, some Age Group men came through, but they were generally (thankfully) well behaved, and their passing didn’t cause me to have to disrupt my own pace, as they quickly moved well clear ahead of me. The bike section went pretty smoothly, until about 90 minutes to go, when I was just finding the head wind a bit soul destroying and all I wanted to do was to get off the bike. I craned my neck roughly every 5 minutes, to look out for the university tower block on the horizon. The scenery was beautiful, but I was already worried about how my sore feet (the road surfaces are not European-styled) were going to cover 42.2k on the ground. 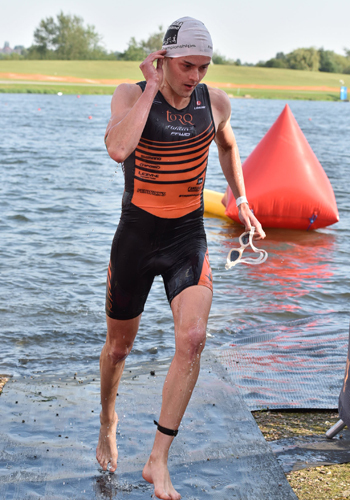 You would think, that after quite a few years in triathlon, I would have the hang of transitions. However, I managed to botch both of them and quite spectacularly. I should be very thankful that the time lost didn’t cost me a place! In T1 (having exited the water in a group), we all bee-lined to the same set of pegs for our run bags and in the flurry, I picked up the wrong bag. I only realized my mistake as I started tipping out my run shoes, squawked, and pegged it back to the racks to get the right bag. Then, coming into T2, I got my feet out of the shoes too early? I still don’t know what happened to my brain, but I was nearly over the dismount line before I knew it! I had to quickly perform something that resembled an emergency stop and thankfully got a foot down in the nick of time, before being catapulted into the air. Grace personified. My sore feet were now a bit more sore and I treated myself to a moment in T2, to get my head together before being ushered out onto the run (via a sunscreen topup). Thankfully, my feet didn’t feel too bad in trainers, but the rest of me was less than impressed. After hours of being without sight of another soul on the bike, there was now nowhere to hide on the run and I felt rubbish. My family were strategically stationed for “cheering on duty” at either end of the course, so I found I had no choice but to look in control. I must admit that even in the first 5km, I had already started to wonder as to how long it would be until I simply had to walk. I started using my TORQ Energy drink earlier than normal, partly because the bottles seemed onerously heavy? Thankfully however, as I turned up the hill towards the uni, my legs sprung a new lease of life and my heart lifted. I was confident that I could get my head back in to the race. By now, I realized that there was going to be no chasing down Caitlin Snow (who I started the run immediately behind), as she’s one of the sport’s faster runners. On lap 2, my Mum and brother looked really excited as they shouted I was gaining on 11th. Amber was clearly having a hard run, and it felt great to gain that one place with relative ease. Things were going well, until half way into lap 3, when it suddenly hit me that my heart rate was starting to drop, taking my pace with it. I fiendishly tried to get in some more gel and energy to stave off the inevitable bonk. Luckily, as we headed back towards the town, a couple of Brit guys came past and after encouraging each other, I did my utmost to keep them in sight to the finish. I was pleased to cross the Finish line in 11th place and remembered to smile up the finish chute. I must admit I was partly disappointed to be outside the money and the bigger Kona points, but I was proud to have given my family a gutsy performance. I am also pleased to be able to say, that I am now starting to get within touching distance of some world class names. It was fantastic to see the British girls, Jodie, Lucy and Susie take the podium – of course, that’s where I aspire to be! As always, you learn something every time you race, and I am super excited to see what happens when I implement some changes next time. In the meantime, time to relax and enjoy some South African style recovery.